If Green Beans, Broccoli, Okra, Sisal, and Geese Aren't Weeds, Why Is a Single Plant With the Attributes of all Five Considered One? Most people know milkweed simply as food for the monarch butterfly's caterpillar, or as a tenacious, pesky weed of hayfields. If those butterflies weren't so beautiful, and if their annual migration to Mexico weren't so amazing, few people would care what happened to this herb. But milkweed isn't your average weed. In World War II, schoolchildren across the Midwest collected thousands of pounds of milkweed fluff to stuff life preservers for the armed forces in the Pacific, because kapok, the normal material used for this purpose, came from Japanese-occupied Indonesia and was unavailable. Today, you can buy pillows, jackets, and comforters stuffed with this material, which is wonderfully soft and has a higher insulative value than goose down, from a company called Ogallala Down, in Ogallala, Nebraska. Some people believe that milkweed will become an important fiber crop, as one of its attributes is that it is perennial and therefore does not need to be replanted every year. Milkweed stalks also produce a coarse, sisal-like fiber that can be used for twine, which varies in strength from one plant to the next. This possibility has been little explored commercially, but it was well known to Native Americans. The milkweed that we are talking about here is the common milkweed Asclepias syriaca. There are numerous other species of milkweed in North America, but common milkweed is by far the best known. It is abundant in the whole area east of the shortgrass prairies, north of the Deep South, and south of the boreal forests of Canada. It is a common sight of roadsides, fencerows, meadows, sunny woods, and abandoned fields. Common milkweed produces pairs of large, oblong, thick leaves all along its unbranching stem, which is typically three to six feet tall. Both the flowers and the okra-like pods are quite distinctive, as is this herb's growth form. When broken, all parts of the plant produce a white latex, but there are many other plants with this characteristic. Overall, milkweed is a beautiful and very distinctive plant. I am amazed that, as much attention as milkweed has received as a fiber crop and a butterfly planting, so little has been said about its use as food. 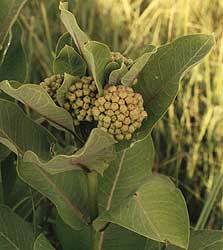 Ethnographic records show that common milkweed was eaten as a vegetable by tribes throughout its range. It provides edible shoots (like asparagus), flower bud clusters (like broccoli), and immature pods (like okra). The soft silk inside the immature pods is a unique food, and the flowers are also edible. Milkweed conveniently provides one or more edible parts from late spring until late summer, making it one of the most useful wild greens to learn. If you've read the accounts of milkweed in any wild food books, you've probably heard that the plants are very bitter and need to be boiled in three changes of water before being eaten. This is simply not true of the common milkweed Asclepias syriaca. The repeated boiling process so carefully described by so many authors is completely unnecessary. Boiling once is perfectly sufficient. In an article in The Forager, Vol. 1 Issue 2, "The Milkweed Phenomenon," I discussed the fact that, although most authors claim that milkweed is bitter, I had discovered none with such a taste in sampling the plant over many years in four Midwestern states. I attributed the discrepancy to a regional difference in flavor caused by hybridization with closely related inedible milkweeds found further east than the areas of my experience. This is apparently wrong. I was giving the authors who claimed it to be bitter the benefit of too much doubt. I received word from a reader in New Jersey who says he's tried the plant from Maine to Georgia on hundreds of occasions and has never encountered any that was bitter. I also spoke with one individual from New York State, and one from Ohio, who refute that milkweed is bitter. I talked at length with Peter Gail, a wild food instructor from Cleveland, Ohio, who was the only acquaintance who had told me that he had found milkweed to be bitter. In fact, it came out in our conversation that he had not personally found milkweed to be bitter. A participant in one of his workshops ate milkweed, which had been boiled in three water changes, and became sick. If water-changing supposedly eliminates the bitterness, what does this mean? Obviously, repeated boiling can't solve the problem of milkweed that makes people sick after being boiled three times. It sounds like a food allergy or intolerance to me. That can happen with any plant, and this is the only case that I've heard of for milkweed. If the participant had found the milkweed bitter, he probably wouldn't have consumed it. It is unfortunate that so many stern warnings have been made about the use of milkweed as food. It is true that all parts of the plant contain small amounts of toxins. (A small amount of toxin is an everyday aspect of human diet.) The toxins in milkweed are washed out of the edible parts by boiling. A small amount of milkweed can be just thrown into recipes, but larger amounts, or milkweed that you plan to eat as a vegetable dish, should probably be boiled first and have the water discarded. After normal preparation milkweed is not a danger, unless you are that rare sensitive individual. Come late May, when oak and maple trees have just begun to adorn themselves with summer splendor, look for the thick shoots of milkweed pushing up among the dead stalks of last year's plants. This has become a springtime ritual for me. I visit the milkweed colonies anxiously, usually much too early - but I'm afraid of missing the best young shoots. Every few days I scour the fields hopefully until, finally, my eyes come to rest on an inconspicuous yet distinct spear of succulent promise. Kneeling to pinch it off at the base, I scan the lush new grass around it and spot a half dozen more. The milkweed season has begun. It is often warned that milkweed shoots closely resemble those of dogbane, a mildly poisonous relative that also produces a milky latex. Of course, you must be positive of your identification before consuming any plant, but don't let anyone convince you that differentiating between milkweed and dogbane is prohibitively difficult. There are a number of differences. Dogbane shoots tend to come up a little earlier, so where the two plants grow side by side (which is not uncommon) they are usually taller. (This is not a reliable indicator, of course.) Dogbane shoots are always much thinner than those of milkweed, and they are usually reddish-purple on the upper part of the stem. Milkweed stems and leaves are minutely fuzzy, while dogbane stems are smooth. As the plants get older, the differences become more obvious, as dogbane tends to form several spreading stems, while milkweed shoots remain unbranched. Milkweed shoots appear asparagus-like, except they have a few pairs of small leaves clasping their sides. The smaller they are, the better they taste - but as long as they bend easily and break off when pinched they are good to eat. Normal size is three to six inches. Just boil the shoots in salted water until they are tender, which is usually twenty minutes or so. (All milkweed parts are cooked in roughly the same manner.) Despite the rather long cooking time, these shrink far less than most green vegetables. Milkweed shoots are almost universally liked. They are often compared to asparagus, but I think the flavor is highly reminiscent of green beans. As the plants grow taller, you can still eat them, using only the top few inches and removing all but the smallest leaves. At this stage they are never quite as good as the younger shoots. In midsummer the unopened flower buds can be gathered. They look like miniature heads of broccoli but are softer. Dice up a small handful of these and toss them into a soup, casserole, pasta dish, stuffing, or stir-fry to excellent effect. To eat larger servings of the flower buds alone, boil them, drain the water, and season. Many people consider this the best part of the milkweed plant. I think they taste almost identical to the shoots and the pods. There is one small warning that must be made with milkweed flower buds: sometimes they are full of tiny monarch caterpillars. Usually the first milkweed flowers in northern Wisconsin appear in early July. The blossoming season is over a month long. The multicolored flowers have a sweet, musky odor and are a favorite of insects. I have read that certain Native American tribes boiled and mashed the flowers to form a kind of sweet sauce, but I have not had any success with this. I have eaten the flowers in small quantities raw, and they have a rather pleasant flavor. As the flowers wither away, seed pods will form in their place along the upper parts of the stem. Even though a cluster contains dozens of flowers, it rarely ends up producing more than four or five seed pods. In a season, an average milkweed stalk produces only four to eight pods. They first appear about the size and shape of a teardrop. When fully grown they will be three to five inches long. Until they are about two-thirds grown the immature pods make a superb vegetable. The smallest pods, under an inch long and still firm, are most desirable. When the pods are fully formed they become tough and unpalatable and should not be eaten. Milkweed pods are excellent in stew, stir-fry, or eaten as a vegetable side dish. They are delicious with cheese and bread crumbs. The pods can also be made into pickles, but they become soft after boiling. The best time to gather milkweed pods is late summer (from early August to early September around here). The size of the pods varies greatly from one plant to the next. An immature pod on one specimen may be larger than a full-grown pod on another, so determining which pods are immature can be tricky. The pods that are too old tend to be rougher on the outside than the young pods. They also tend to have more pointed, curved tips. These are tendencies, not rules, however. There are a few more reliable ways to determine the age of pods. There is a line running the length of each pod, along which it will split open to release its seeds when mature. If you pull apart on both sides of this line and it splits open easily, the pod is probably too old to use. For the beginner, it is best to open up several pods and examine the insides to get an idea of which ones are in the proper stage for harvesting. In an immature milkweed pod (one that can be eaten) all of the seeds will be completely white, without even a hint of browning. The silk should be soft and juicy, not fibrous. It should be easy to pinch through the bundle of silk or to pull it in half. Immature pods are also plumper and harder than mature ones. Don't let this seem more complicated than it really is - with time you will know, at a glance, which pods to collect. A few times each season I gather a large quantity of milkweed pods. I work my way through my favorite patch and fill a cloth bag, which doesn't take very long, since milkweed often grows in large, prodigious colonies. I leave the tiny pods for next time, and ignore those that are questionably old. When I get home I sort through the pods, keeping all of those less than about 1.5 inches long to be eaten whole. If I do not use these immediately, I can or freeze them (after parboiling). 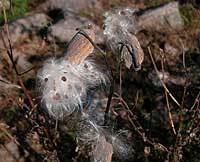 Milkweed pods, after they are picked, begin to toughen in a few hours, and may become unpalatable in a day or less. The lowly common milkweed provides two different useful kinds of fiber (stalk fiber and silk), plus six different vegetables (shoots, leafy tops, flower buds, flowers, immature pods, and white). It is abundant, easy to recognize, familiar to many of us, and is a perennial that appears in the same place year after year. It's blossoms feed numerous kinds of butterflies, including our most beloved, as well as hummingbirds and honey bees. Pretty amazing, huh? Some species besides common milkweed are edible, however. Notable among these is showy milkweed A. speciosa, which occurs on the high western plains and in the lower elevations of the Rockies. In my limited experience, this plant is nearly as palatable as the common milkweed found further east. I have not tried all the edible parts, however. Last spring, I first tried shoots of poke milkweed A. exaltata, which is common in wooded areas of much of Eastern North America. To my surprise, they were as good or better than those of the common milkweed - tender and not even slightly bitter. I had never heard, in print or in writing, any specific accounts of this plant being eaten - but I certainly will keep my eye out for it from now on. In July, I tried the immature pods of poke milkweed. They were faintly bitter but otherwise pleasant in taste. There are several species of large milkweed, such as blunt-leaf milkweed A. amplexicaulis of the East, which I have never had the chance to try, and to which I have never found a specific reference regarding edibility. If you insist on trying one of these plants, remember this rule: if it is bitter, do not eat it! If you wish you can try the old technique of throwing the plants in boiling water, draining after a few minutes, and repeating this several times to eliminate the bitterness. On the other hand, if the plants are truly milkweeds (genus Asclepias, except for butterfly weed) and they taste pleasant, go ahead and eat them. Then write to The Forager so others can learn from your experience. However, make sure that you only eat shoots, young tops, flower buds, or immature pods - not any older pods or foliage. 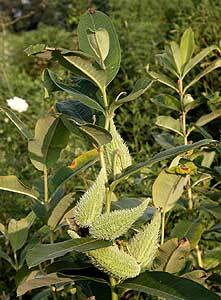 None of these other milkweeds are encountered as frequently as the common milkweed, however. I suggest that beginners focus on that plant first. 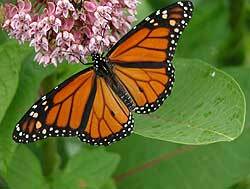 Because of the myths surrounding the plant, many people have kept their distance from the common milkweed. This is sad because it is one of our best tasting, easiest to harvest, and most abundant edible wild plants. This wonderful weed should be a lesson to us all. What other treasures have we been ignoring, though they abound beside us, for the last few hundred years? ScienceViews.com copyright © 2005-2009 Calvin & Rosanna Hamilton. All rights reserved.